Today is Tax Day 2016. Today is Tax Day 2016. This is the deadline for filing all 2015 Federal Tax Returns. If you attempt to file and are rejected, you will have until the 23rd to refile. Tax Day was moved to the 18th of April this year because of this. Don’t fret if you have not filed your 2015 tax return yet, there is still time to file a 2015 tax extension. Also, you can file today and will still be considered on time for filing, check out our Free Tax Filing sister site, here. Tax Day 2016 does have some perks. See below for some great freebies and goodies. 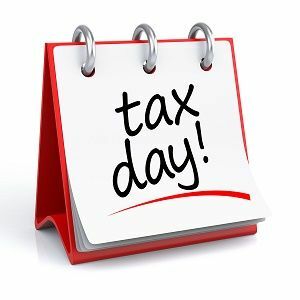 Many websites will be having discounts and deals for Tax Day 2016, just check out your favorite website or keep an eye on your email for Tax Day goodies. Noodles & Co.: On April 18, buy any entree, get a kids’ meal free. Kids (“your little deductibles”) must be present. From April 11 to 18, order online and use code TAXDAY to get $4 off your order of $10 or more. Hot Dog on a Stick: Get one free Original Turkey Dog on a Stick at participatinglocations. Kona Ice: Get a free tropical shaved ice on Tax Day. Tweet your ZIP code [email protected] to find the Kona Ice truck’s location in your community. Office Depot: Visit the 2015 taxes guide for a coupon for 5 pounds of free bulk bin shredding in-store through April 23. Planet Fitness: Download a coupon from the Planet Fitness site for a free Hydro Massage. Must be 18 years or older and have an ID present. Hard Rock Cafe: Sing a song on the cafe stage in front of the entire restaurant at participating locations on April 18 to receive a free Legendary Burger. This is just the larger companies and their advertised 2016 tax day events. Check out your local companies websites and in-store for their tax day deals.